Non-fiction double whammy! I know, I know, you are wondering if you are in the right place. Two non-fiction books in a row? There may be perplexed expressions or scratching of heads. Well…in the interest of full disclosure, I did read Great House before Woe Is I. But Great House is giving me all of these thoughts and feelings and things, and I need some time to muse and ruminate. 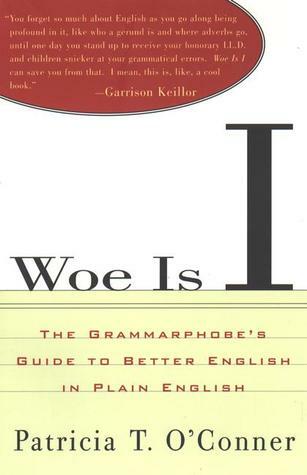 Woe Is I, on the other hand, is all about the grammar and if you know me, it’s sort of my favorite thing to talk about. Patricia T. O’Conner is a former editor for the New York Times. She is so good at grammar that she actually taught other smarty pants people who work at the Times about not making fools of themselves on the page. This is a wonderful thing, because if fancy schmancy editors sometimes get confused about when to use ‘that’ and when to use ‘which,’ we can obviously all stop feeling bad about our own grammar mistakes. Woe Is I is set up into easy to understand chapters, covering tricky topics like pronouns, possessives, punctuation, and so-called language rules. This book is perfect for reading cover to cover as a refresher or keeping handy to answer a specific question. O’Conner has provided both a glossary and an index, so you can find your answer quickly and move on with your literary masterpiece. Woe Is I is a handy book to have on your bookshelf. If you are a serious writer, I would advise you to have several reference books on hand. This book includes a bibliography to get you started. O’Connor works very hard to make this an accessible read for the everyday person. She is looking to clarify, not confuse, and so she does not delve heavily into the technicalities of grammar. This is a book you can quickly refer to so you don’t make the embarrassing mistake of writing that your relatives immigrated from Russia. I’m just happy to know that the grammar police will not descend upon me if I occasionally end a sentence with a preposition. So, fellow writers and editors, what are your favorite writing or grammar guides? It wasn't still I started teaching ten year olds this year (I had always taught younger children before, who were learning to write simple sentences with only basic grammar) that I started to think about how crazy our grammar is and how difficult it is to explain. Hats off to the author if she manages to explain it well! I read some reviews where people argued that it insulted their intelligence, but I would rather have an easy reference guide than find myself completely puzzled! Wednesdays with David: Party Time! It's Monday and I'm back! It's Monday and June is here!